APPSC Food Inspectors Recruitment, APPSC Food Safety Officers Recruitment 2019, Apply Online till March 27. Food Safety Officer in A.P. Institute of Preventive Medicine, Public Health Laboratories and Food (Health) Administration Subordinate Service: Andhra Pradesh Public Service Commission or APPSC has released a notification for the recruitment of Food Safety Officer in A.P. Institute of Preventive Medicine, Public Health Laboratories and Food (Health) Administration Subordinate Service. 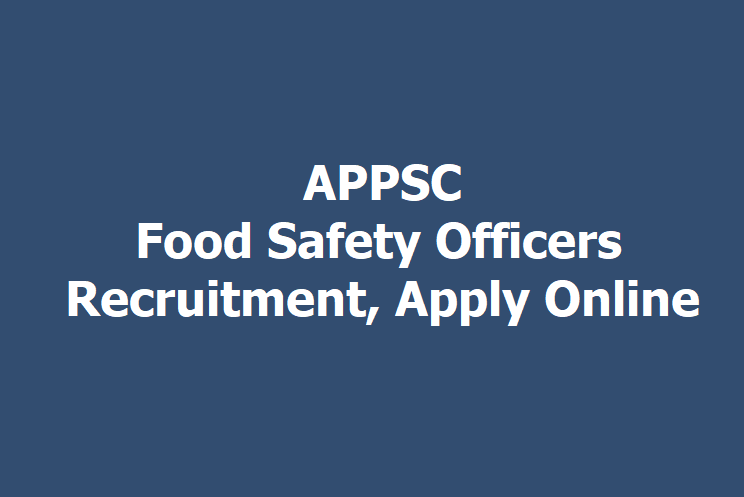 The APPSC has invited applications through online from eligible candidates for recruitment to the post of Food Safety Officer within the age group of 18 to 30 years as on July 1, 2019. The online applications for APPSC Food Safety Officer will be available on Commission's Website -- psc.ap.gov.in -- from March 07, 2019 to March 28, 2019. Out of total 13 vacancies announced Food Safety Officer in A.P. Institute of Preventive Medicine, Public Health Laboratories and Food (Health) Administration Subordinate Service. APPSC Recruitment 2019: The Andhra Pradesh Public Service Commission (APPSC) has issued a recruitment notification. As per the notification candidates are invited to fill up the posts for Assistant Statistical Officer posts in A.P. Economics and Statistical Sub-Service. A total of 78 posts vacancies has been announced by the commission. All the eligible and interested candidates can apply for the post at the APPSC official website-psc.ap.gov.in. Candidates are informed that the last date to apply for the post is March 6, 2019. Candidates have to pay Rs 250/- as application processing fee and Rs 80/- as examination fee. Candidates will be selected based on the merit in the computer based examination. Before applying for the post, applicants may register their bio-data particulars through One Time Profile Registration (OTPR) on the Commission's Website viz., https://psc.ap.gov.in. Once applicants register their particulars, a user ID is generated and will be sent to their registered mobile number and email ID. Applicants need to apply for the post using the OTPR user ID through Commission's website. The Commission conducts Screening test in offline mode in case applicants exceed 25,000 in number and likely to be held on May 22, 2019. Instructions regarding recruitment exams can be found on the official website of APPSC. Tentatively the main examination in online mode for candidates selected in screening test will be held through computer based test to be held in the month of August 2019, said the official notification. The candidates are required to visit the Commission's website regularly to keep themselves updated about confirmed dates of exams to be held.